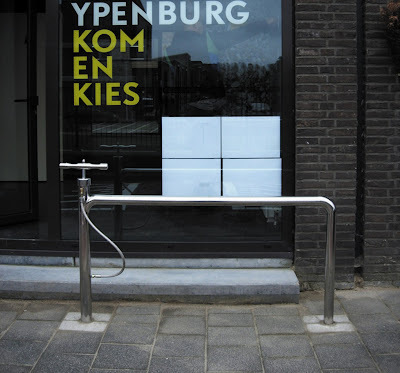 The Airago - type Ypenburg - combination bike rack and air pump is simple Northern European design at its best. If it isn't the Danes designing something cool, functional and just plain fantastic, then you can bet your bottom euro that it's the Dutch. The Airago is the brainchild of Studio HiMom founded by designers Krijn Christiaansen & Jeroen Bruls. They aim to design products 'dedicated to public space phenomena'. You can lock your bike to the rack and/or pump your tyres with the shiny pump. The goal with the Airago was to 'stimulate an interaction between neighbours while pumping up the tyres of their bicycles'. 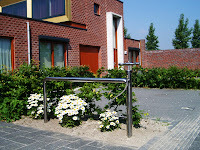 It was concieved as an art project in a newly-built neighbourhood in the Netherlands, Ypenburg. It won a design prize in 2006 and we would love to see one placed next to the bike sheds outside our Copenhagen flats.